DESCRIPTION: Japanese beads and fine dabka Zardosi hand embroidered ombre silk pouch with a bottom tassel, wristlet and long chain handle. COLOR: Blush Pink. CARE: Store in dust bag. Keep away from moisture. DIMENSIONS: 22 cm x 19 cm . 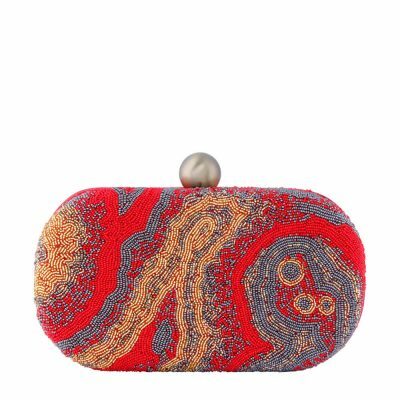 DESCRIPTION: This trendy portrait shaped flapover clutch is delicately hand embroidered with fine japanese beads. 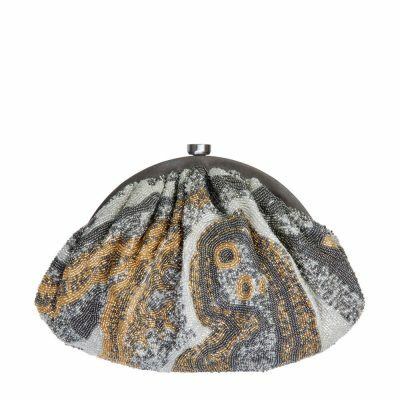 It has a suedette lining and a long chain handle .The design is reminiscent of the patterns created by mist and fog in a meditative setting and is symbolic of the idea that all the world's beauty is present right HERE within us. STYLE TIP : Carry it with your blue denims, classic shirts, cold shoulder blouses and T-shirts as well as traditional Indianwear. 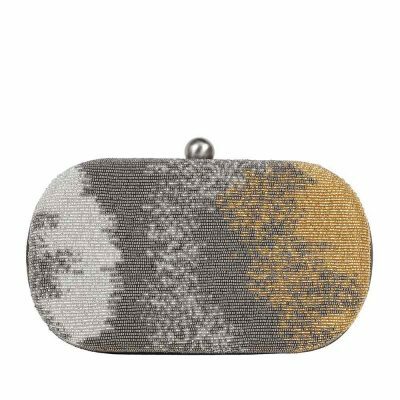 Use it as a belt bag with a thin leather belt (available separately) for an effortlessly chic look. COLOR: Gold. CARE: Store in dust bag. Keep away from moisture. DIMENSIONS: 12 cm x 17 cm. 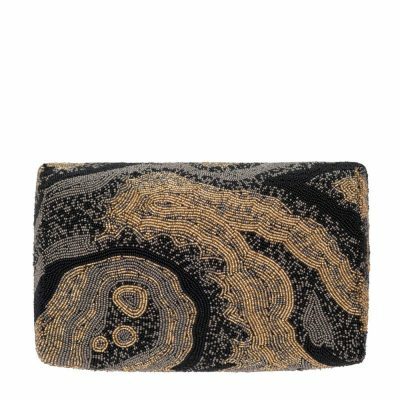 DESCRIPTION: This elegant zen Inspired satin oval box clutch is delicately hand embroidered with fine sequins, crystals and japanese beads. It has a long chain handle, dimante clasp, contrast suedette lining and a handbeaded tassel at the bottom. STYLE TIP: Carry with western as well as traditional Indianwear. Style the clutch with your LBDs, blue denims, classic shirts, blouses and T-shirts to add a chic accent to them. COLOR: Midnight Blue. CARE: Store in dust bag. Keep away from moisture. DIMENSIONS: 20 cm x 11 cm. 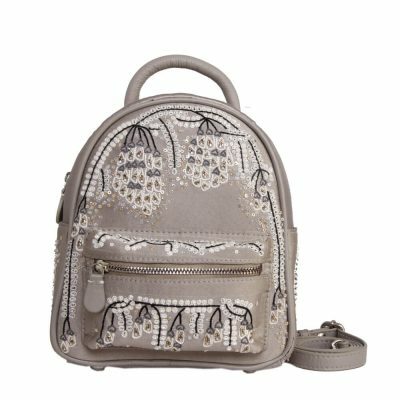 DESCRIPTION: Edgy and fun, this zen inspired satin backpack also doubles up as a side sling bag. It can be your perfect day to night style fix. the idea is to add luxury to everyday things. 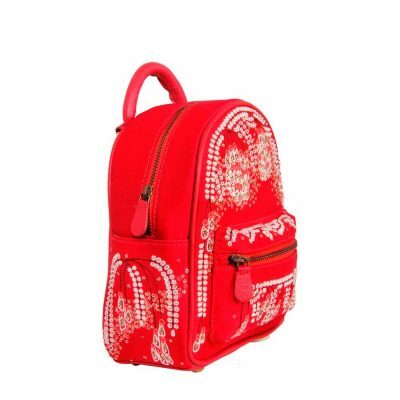 It is delicately hand embroidered with fine sequins, crystals and japanese beads. It has a contrast suedette lining and pure leather trims. The sequin flow is reminiscent of the patterns created by mist and fog in a meditative setting. STYLE TIP: It can be used with westerns and traditional Indianwear. Style the backpack with your anarkalis, maxis, skirts and lehengas for an effortlessly chic look. COLOR: Dove Grey. CARE: Store in dust bag. Keep away from moisture. DIMENSIONS: 17 cm x 8 cm x 19 cm. 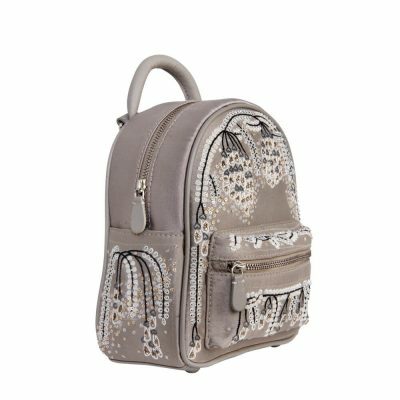 DESCRIPTION: Edgy and fun, this zen inspired satin backpack also doubles up as a side sling bag. It can be your perfect day to night style fix. the idea is to add luxury to everyday things. It is delicately hand embroidered with fine sequins, crystals and japanese beads. It has a contrast suedette lining and pure leather trims. The sequin flow is reminiscent of the patterns created by mist and fog in a meditative setting. STYLE TIP: It can be used with westerns and traditional Indianwear. Style the backpack with your anarkalis, maxis, skirts and lehengas for an effortlessly chic look. COLOR: Red. CARE: Store in dust bag. Keep away from moisture. DIMENSIONS: 17 cm x 8 cm x 19 cm. 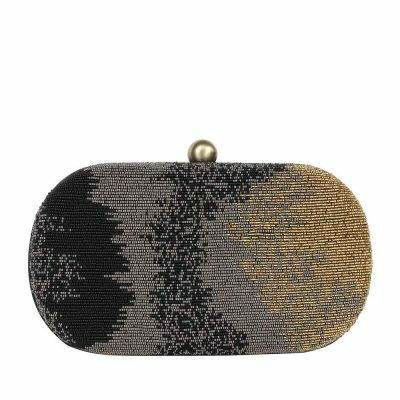 DESCRIPTION: This timeless flapover clutch is delicately hand embroidered with fine japanese beads. It has a suedette lining & long chain handle.The design has a pschyadelic feel, transporting one to an awe inspiring world of fantasy. STYLE TIP: Carry it as a sling bag with your blue denims, classic blouses, maxis, evening ensembles as well as traditional Indianwear for a classic modern look. COLOR: Crimson Red. CARE: Store in dust bag. Keep away from moisture. DIMENSIONS: 16 cm x 10.5 cm x 6.5 cm. 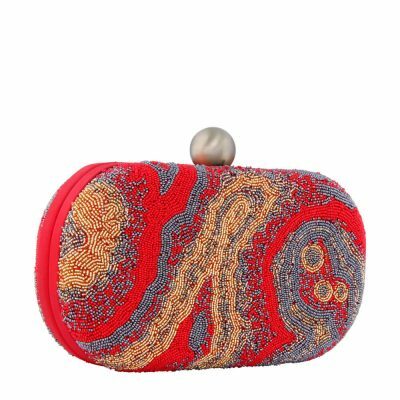 DESCRIPTION: This timeless flapover clutch is delicately hand embroidered with fine japanese beads. It has a suedette lining & long chain handle.The design has a pschyadelic feel, transporting one to an awe inspiring world of fantasy. STYLE TIP: Carry it as a sling bag with your blue denims, classic blouses, maxis, evening ensembles as well as traditional Indianwear for a classic modern look. COLOR: Black. CARE: Store in dust bag. Keep away from moisture. DIMENSIONS: 16 cm x 10.5 cm x 6.5 cm. 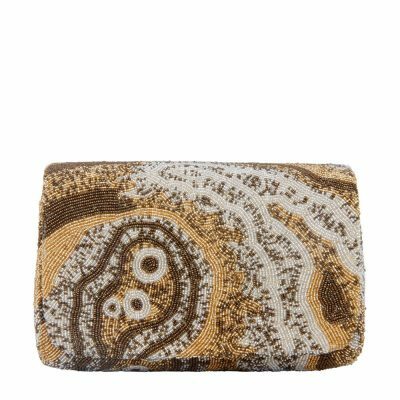 DESCRIPTION: This elegant and timeless pouch doubles up as a sling pouch and a potli. It is delicately hand embroidered with fine japanese beads. It has a suedette lining, long detacheable chain handle, wristlet handles and handbeaded tassels. 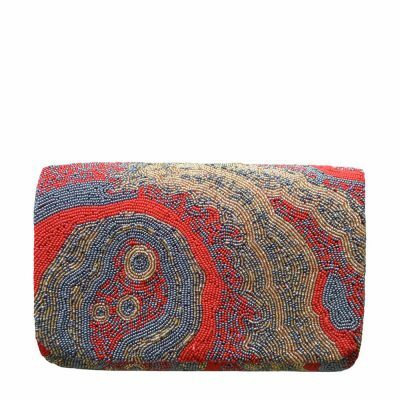 The pattern has a pschyadelic feel, transporting one to an awe inspiring world of fantasy. STYLE TIP: Carry it as a sling bag with your blue denims, classic blouses, maxis,evening ensembles as well as traditional Indianwear for a classic modern look. COLOR: Crimson Red. CARE: Store in dust bag. Keep away from moisture. DIMENSIONS: 24 cm x 22 cm. 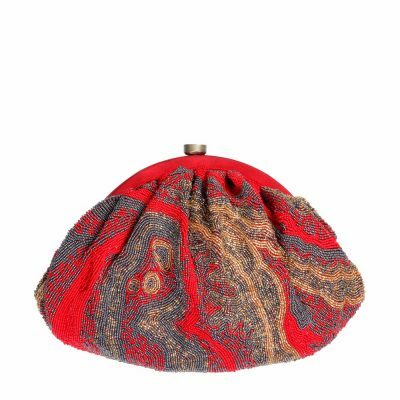 DESCRIPTION: This elegant and timeless pouch doubles up as a sling pouch and a potli. It is delicately hand embroidered with fine japanese beads. It has a suedette lining, long detacheable chain handle, wristlet handles and handbeaded tassels. 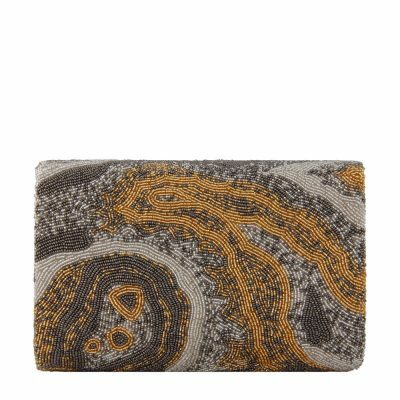 The pattern has a pschyadelic feel, transporting one to an awe inspiring world of fantasy. STYLE TIP: Carry it as a sling bag with your blue denims, classic blouses, maxis,evening ensembles as well as traditional Indianwear for a classic modern look.COLOR: Black. CARE: Store in dust bag. Keep away from moisture. DIMENSION: 24 cm x 22 cm. 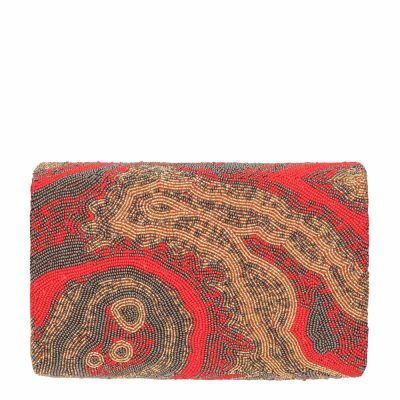 DESCRIPTION: This elegant pouch is delicately hand embroidered with fine japanese beads. It has a suedette lining & long chain handle.The design has a pschyadelic feel, transporting one to an awe inspiring world of fantasy. STYLE TIP: Carry it as a sling bag with your blue denims, classic blouses, maxis, evening ensembles as well as traditional Indianwear for a classic modern look. COLOR: Gold. CARE: Store in dust bag. Keep away from moisture. DIMENSIONS: 26 cm x 16 cm. 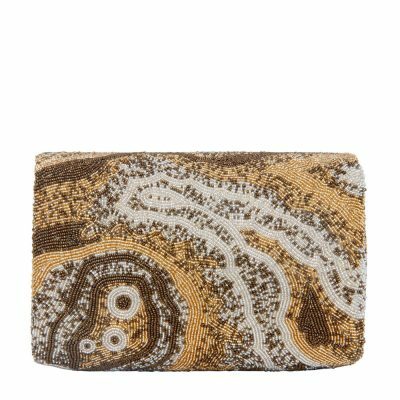 DESCRIPTION: This elegant pouch is delicately hand embroidered with fine japanese beads. It has a suedette lining & long chain handle.The design has a pschyadelic feel, transporting one to an awe inspiring world of fantasy. STYLE TIP: Carry it as a sling bag with your blue denims, classic blouses, maxis, evening ensembles as well as traditional Indianwear for a classic modern look. COLOR: Red. CARE: Store in dust bag. Keep away from moisture. DIMENSIONS: 26 cm x 16 cm. 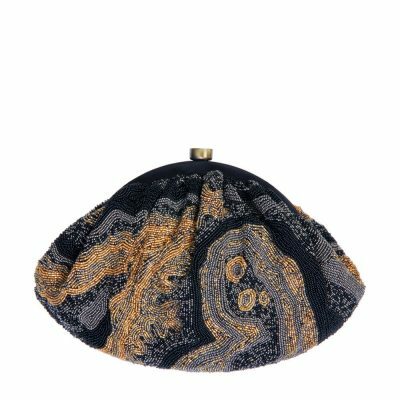 DESCRIPTION: This elegant pouch is delicately hand embroidered with fine japanese beads. It has a suedette lining & long chain handle.The design has a pschyadelic feel, transporting one to an awe inspiring world of fantasy. STYLE TIP: Carry it as a sling bag with your blue denims, classic blouses, maxis, evening ensembles as well as traditional Indianwear for a classic modern look. COLOR: Silver. CARE: Store in dust bag. Keep away from moisture. DIMENSIONS: 26 cm x 16 cm. 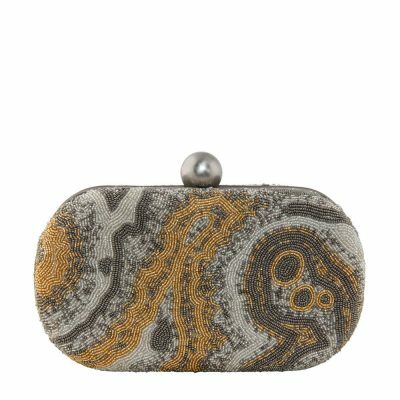 DESCRIPTION: This timeless flapover clutch is delicately hand embroidered with fine japanese beads. It has a suedette lining & long chain handle.The design has a pschyadelic feel, transporting one to an awe inspiring world of fantasy. STYLE TIP: Carry it as a sling bag with your blue denims, classic blouses, maxis, evening ensembles as well as traditional Indianwear for a classic modern look. COLOR: Gold. CARE: Store in dust bag. Keep away from moisture. DIMENSIONS: 16 cm x 10.5 cm x 6.5 cm. 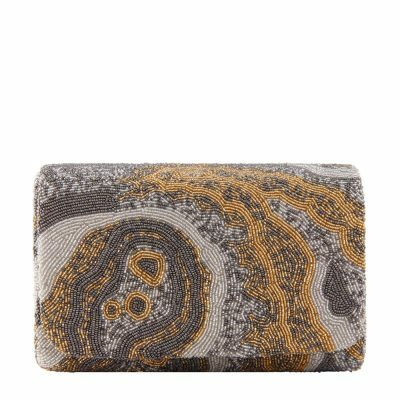 DESCRIPTION: This timeless flapover clutch is delicately hand embroidered with fine japanese beads. It has a suedette lining & long chain handle. The design has a pschyadelic feel, transporting one to an awe inspiring world of fantasy. STYLE TIP: Carry it as a sling bag with your blue denims, classic blouses, maxis, evening ensembles as well as traditional Indianwear for a classic modern look. COLOR: Silver. CARE: Store in dust bag. Keep away from moisture. DIMENSIONS: 16 cm x 10.5 cm x 6.5 cm. 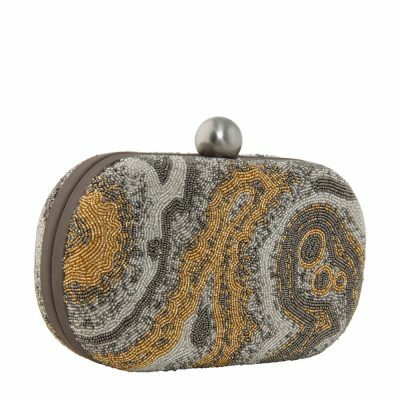 DESCRIPTION: This timeless clutch is delicately hand embroidered with fine japanese beads. It has a suedette lining & long chain handle.The design has a pschyadelic feel, transporting one to an awe inspiring world of fantasy. STYLE TIP: Carry it with your blue denims, classic blouses, maxis, evening ensembles as well as traditional Indianwear for a classic modern look. COLOR:Red. CARE: Store in dust bag. Keep away from moisture. DIMENSIONS: 20 cm x 11 cm. 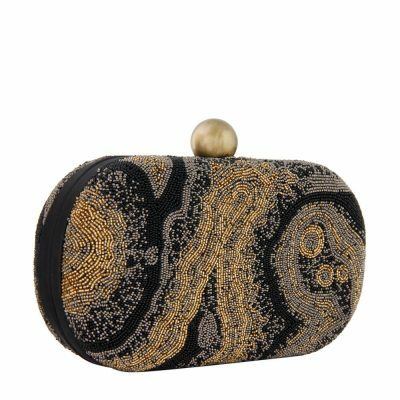 DESCRIPTION: This timeless clutch is delicately hand embroidered with fine japanese beads. It has a suedette lining & long chain handle.The design has a pschyadelic feel, transporting one to an awe inspiring world of fantasy. STYLE TIP: Carry it with your blue denims, classic blouses, maxis ,evening ensembles as well as traditional Indianwear for a classic modern look. COLOR: Black. CARE: Store in dust bag. Keep away from moisture. DIMENSIONS: 20 cm x 11 cm. 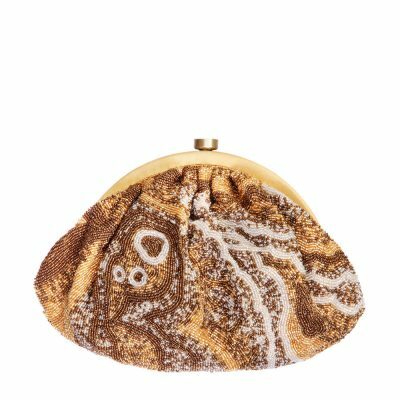 DESCRIPTION: This elegant pouch is delicately hand embroidered with fine japanese beads. It has a suedette lining & long chain handle.The design has a pschyadelic feel, transporting one to an awe inspiring world of fantasy. STYLE TIP: Carry it as a sling bag with your blue denims, classic blouses, maxis, evening ensembles as well as traditional Indianwear for a classic modern look. COLOR: Black. CARE: Store in dust bag. Keep away from moisture. DIMENSIONS: 26 cm x 16 cm. 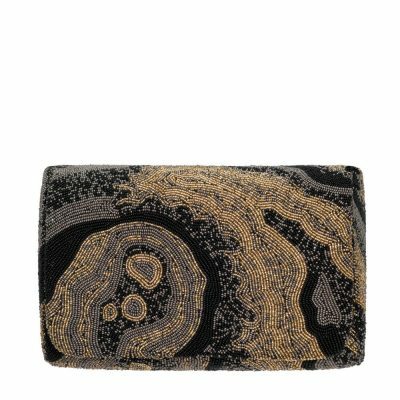 DESCRIPTION: This timeless clutch is delicately hand embroidered with fine japanese beads. It has a suedette lining & long chain handle.The design has a pschyadelic feel, transporting one to an awe inspiring world of fantasy. STYLE TIP: Carry it with your blue denims, classic blouses, maxis, evening ensembles as well as traditional Indianwear for a classic modern look. COLOR: Gold. CARE: Store in dust bag. Keep away from moisture. DIMENSIONS: 20 cm x 11 cm. 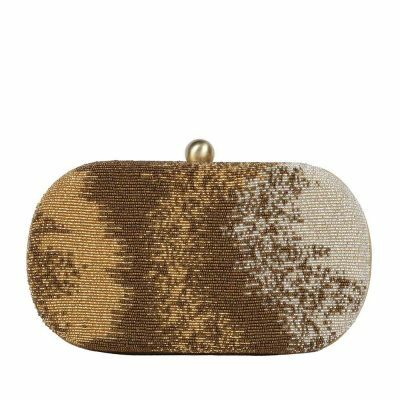 DESCRIPTION: This timeless clutch is delicately hand embroidered with fine japanese beads. It has a suedette lining & long chain handle.The design has a pschyadelic feel, transporting one to an awe inspiring world of fantasy. STYLE TIP: Carry it with your blue denims, classic blouses, maxis, evening ensembles as well as traditional Indianwear for a classic modern look. COLOR: Silver. CARE: Store in dust bag. Keep away from moisture. DIMENSIONS: 20 cm x 11 cm. DESCRIPTION: This timeless clutch is delicately hand embroidered with fine japanese beads. It has a suedette lining & long chain handle. STYLE TIP: Carry it with your blue denims, classic shirts, cold shoulder blouses, T-shirts as well as traditional Indianwear for a boho chic look. COLOR: Black. CARE: Store in dust bag. Keep away from moisture. DIMENSION: 20 cm x 11 cm. 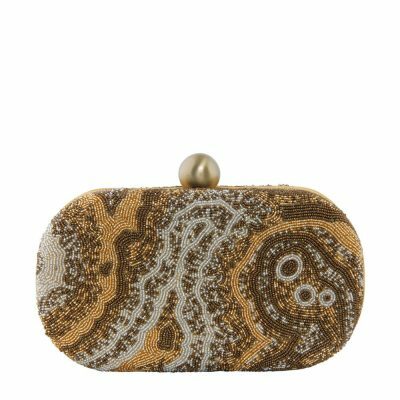 DESCRIPTION: This timeless clutch is delicately hand embroidered with fine japanese beads. It has a suedette lining & long chain handle. STYLE TIP: Carry it with your blue denims, classic shirts, cold shoulder blouses, T-shirts as well as traditional Indianwear for a boho chic look. COLOR: Gold. CARE: Store in dust bag. Keep away from moisture. DIMENSION: 20 cm x 11 cm. 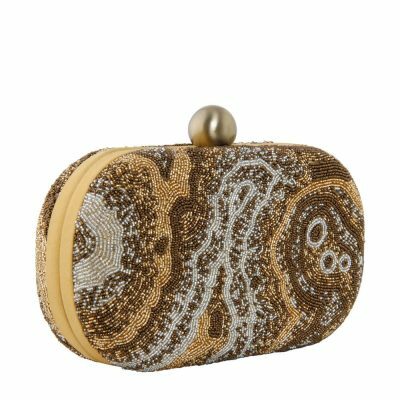 DESCRIPTION: This timeless clutch is delicately hand embroidered with fine japanese beads. It has a suedette lining & long chain handle. STYLE TIP: Carry it with your blue denims, classic shirts, cold shoulder blouses, T-shirts as well as traditional Indianwear for a boho chic look. COLOR: Silver. CARE: Store in dust bag. Keep away from moisture. DIMENSION: 20 cm x 11 cm. DESCRIPTION: This statement bag is your day to night style fix. It can be used as a backpack as well as a side sling bag. 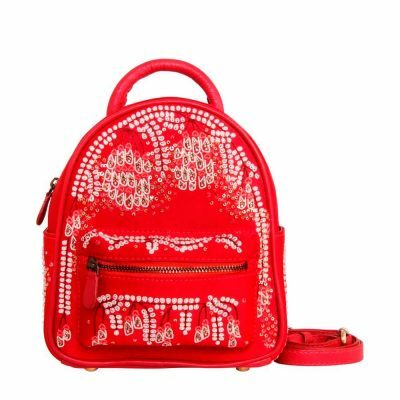 It is spacious and delicately hand embroidered with fine sequins, crystals and japanese beads. It has a contrast suedette lining and pure leather straps. It is inspired by the zen concept that all that we could need to feel truly elated is present right HERE within us - The house motif symbolising our inner self. STYLE TIP: Carry with westerns and traditional Indianwear. Style the backpack with your anarkalis, maxis, skirts and lehengas for an effortlessly chic look. COLOR: Crimson Red. CARE : Store in dust bag. Keep away from moisture. DIMENSION: 20 cm x 10 cm x 23 cm. 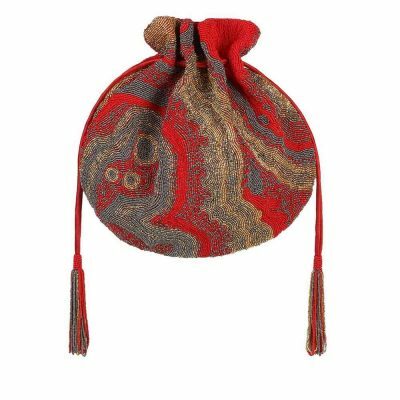 This Zen Inspired potli is delicately hand embroidered with fine japanese beads. 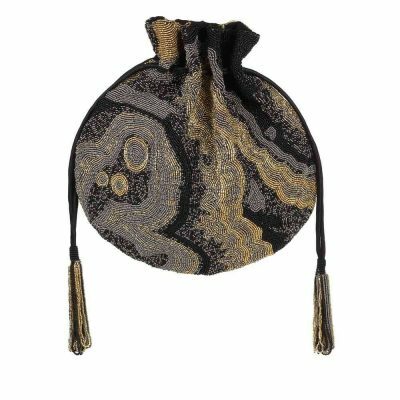 It has a suedette lining, long chain handle and beaded tassels .The design is reminiscent of the patterns created by mist and fog in a meditative setting and symbolic of the idea that all the world's beauty and power is present right HERE within us. COLOR: Crimson Red. CARE: Store in dust bag.Keep away from moisture.